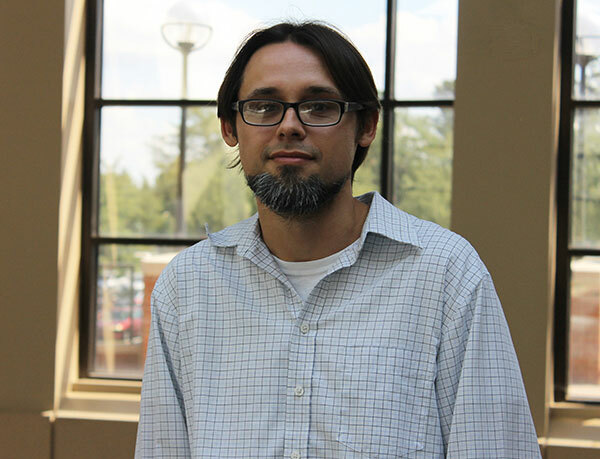 Dr. Matt Noble, assistant professor of math, is the 2018 recipient of the faculty award for Outstanding Scholarship. Full name: Dr. Matt Noble. Title: Assistant professor of mathematics. Degrees: Bachelor of Science, Master of Applied Mathematics, and Ph.D. in mathematics, all from Auburn University. "On the research front, I like thinking about combinatorics, geometry, number theory - often all three at the same time! I have produced a dozen papers in these subjects with a number of others somewhere in the publication pipeline. To me, the best kind of problem to work on is one whose statement is very easy to grasp, yet whose solution is very difficult. Hmm, that sounds like fun. "At Middle Georgia State, I (along with Abby Noble and Chris Rigsby) organize the Academic Bowl tournament in the spring. With Duane Day and Jonathan Joe, Abby and I also put on the 'Mathematical Puzzle Party' in the fall. This is a competition for local high school students where the questions take the form of team-oriented problem solving, and students are exposed to subject matter beyond the usual algebra, trigonometry, and calculus seen in a standard high school curriculum. Last year was the inaugural running of this event, and everyone involved seemed to have a good time." "There's something in academia commonly called the 'two-body problem,' and it refers to the difficulty in finding two positions for similarly credentialed people at the same institution, or even in the same city. My wife, Abby, is also a professor in the math department at MGA, and were were very lucky to find a place to work together. Also, both of us have lived in the southeast all our lives, so it's nice to be (relatively) close to family and friends." "The math department at MGA has a very laid-back atmosphere. I've had jobs before where everyone was constantly involved in everyone else's daily business. That's not the case here at all. Other faculty members are always friendly and accommodating, but at the same time, one is given the freedom to teach their classes and do their job the way they best see fit. It's very refreshing." "Okay, in saying this, I probably sound like an old man sitting on the front porch griping about 'kids these days,' but the key to being a good student lies in avoiding clearly bad practices. Attend class. While attending, pay attention instead of playing on your phone. Take advantage of your instructor's office hours. If you have a question, ask it. Sounds pretty obvious, right? As far as mathematics goes, I've always thought the best students are the ones that maintain a curiosity in their classes. Come on, it's fun to learn new stuff!" "I had a brief appearance on the game show Jeopardy! in the summer of 2013. I won one game and then lost the next. My biggest pet peeve consists of watching contestants make dumb wagering decisions in the final Jeopardy round, and when this happens (seemingly on a daily basis), it causes me to fly into a Hulk-like rage."